I was looking through some old photos on my laptop and came across some snaps I’d taken years back at the exhibition ‘From Death to Death and Other Small Tales: Masterpieces from the Scottish National Gallery of Modern Art and the D. Daskalopoulos Collection’. I could kick my younger self! If only I could go back and relive this exhibition knowing what I know now! I must have been about…seventeen when I saw this? I think. So only really starting to realise the direction my art would take. This exhibition, although I did not realise it at the some, had some really big names to it. Artists such as Paul McCarthy, Mona Hatoum, Helen Chadwick, Ernesto Neto were all part of it. I have researched and studied them all since being at uni and therefore have an entirely new found appreciation for their work. It gets worse though. Other artist work included belonged to Marina Abramovic – one of THE innovators of performance art. One of the most prominent females in what had previously been a largely male dominated art form. One of my current main influences! Marcel Duchamp as well, one of the pioneers of the Dada movement which not only fueled Surrealism but was the platform for conceptual art. Joseph Beuys, again very revolutionary and brought about a whole new dimension and meaning to the word sculpture. Knowing what I know now, I could not be more frustrated by the naivety of my younger self. I was looking at revolutionary artwork by revolutionary artists and I didn’t even know it! So frustrating…The absolute worst past is that the entire exhibition is centered on the human body which is of course the subject of all my work these days. If only I could see the entire exhibition again! 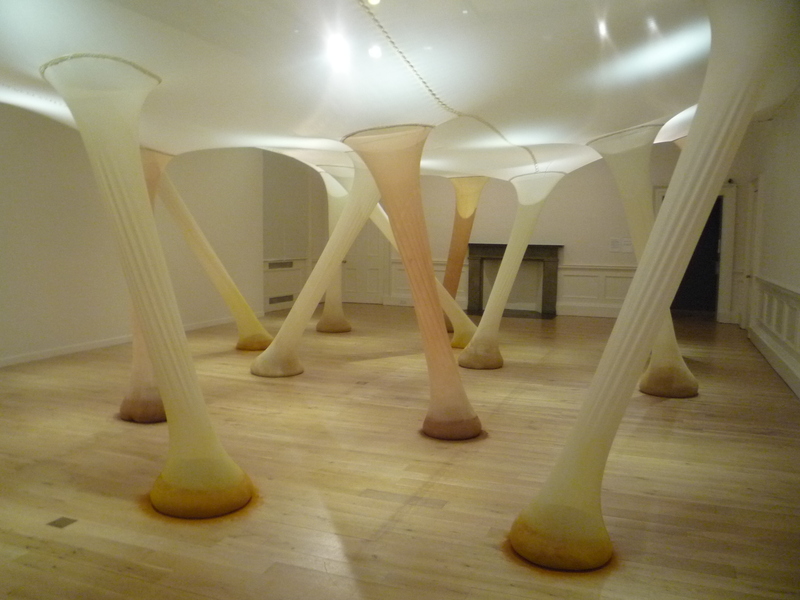 I think one of the works I would be most excited to see again is the work of Ernesto Neto (above). I still remember my reaction when I walked into the room. It was not the site that struck me initially; it was the smell. He had filled his installation with a variety of spices to the point that is was almost overwhelming. Yet it was also incredibly exciting as for the first time I was experiencing multi-sensory artwork! It actually inspired me to use spices in my own work. Slight mistake given that at A Level you have to paint your final piece in two days straight. Not good when you’re using spices – I don’t think curry powder has ever given me such a headache!